Machete Cold Steel Magnum Kukri Machete(97MKM) Machetes for every day use. 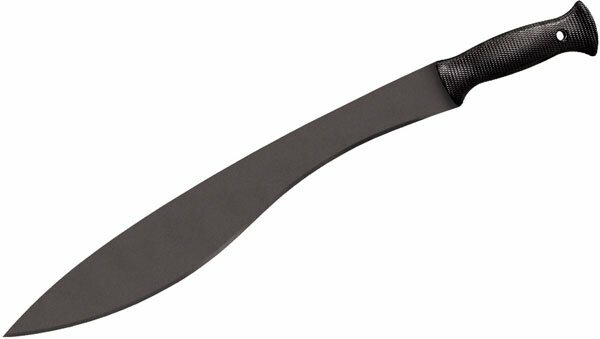 Cold Stell machetes - high carbon steel survival machetes. There’s no single edged weapon that we can think of that can out-chop or out-cut a good Kukri. It’s true that the best Kukris, like our LTC and Gurkha models, can be somewhat expensive. While those “thoroughbreds” perform extraordinarily well for the money that they cost, it sometimes seems that what’s required is a good, inexpensive, “workhorse” model. Our Kukri Machetes are those workhorses. They are available in two sizes, one has a thirteen inch blade and the other, our new “Magnum” model has a whopping seventeen inch blade. Both are ready to plow through the toughest chores life can dish out. Each features the distinctive weight-forward balance of our “top-of-the-line” models, and always present their edge on an angle so they’re guaranteed to “bite” deep with every stroke. Additionally, they come complete with a sturdy Cordura sheath! They're a solid value, ready for long, hard work.